On Tuesday 2nd July we hosted an event that looked at the opportunities and challenges of undertaking large-scale public social science projects. The session looked at the ways in which academics are seeking to make their research and disciplines more public, and for their research to be part of public debate on key societal issues. We also looked at how these projects fit within the impact agenda and their challenges to traditional academic dissemination. This event was chaired by Jane Tinkler, Research Fellow and Manager of the LSE Public Policy Group. 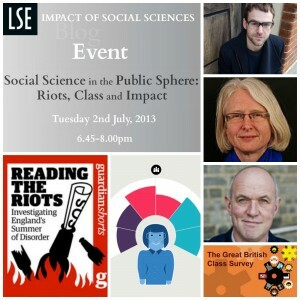 Professor Tim Newburn (LSE) discussed the Reading the Riots project. 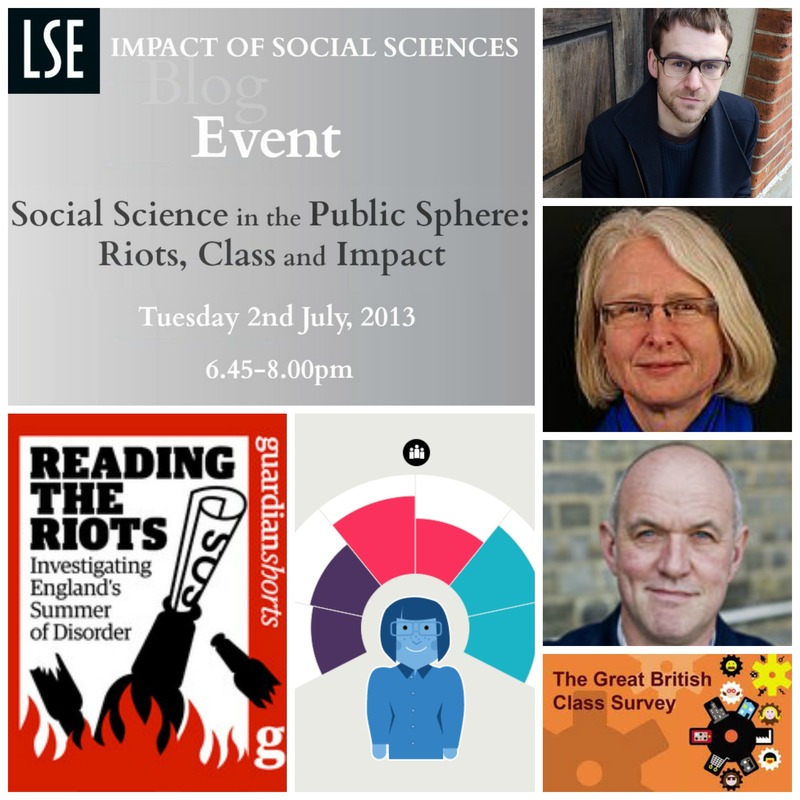 This project was run jointly with the Guardian and its aim was to produce evidence-based social research that would help explain why the rioting spread across England in the summer of 2011. Professor Fiona Devine (Manchester) and Dr Sam Friedman (City) discussed the Great British Class Survey. Run jointly with BBC Labs, this project sought to understand whether class was still relevant today and, if so, what Britain’s class system really looks like. A full podcast of the event is available here. A Storify of the tweets related to the discussion is available here. All presentation slides from the speakers are available on slideshare below. Fiona Devine is Professor of Sociology and Head of the School of Social Sciences (2009-12). She joined the University of Manchester in 1994 and was promoted to Professor in 2001. Prior to joining Manchester, she worked at the University of Liverpool, the Policy Studies Institute and the (then) Department of Employment HQ in London. Fiona’s research interests are in the field of social stratification and mobility, work and employment, and politics and participation from a comparative US/UK perspective. Much of her research has been funded by grants from the ESRC and the Leverhulme Trust. Fiona was a member of Council of the Economic and Social Research Council and Chair of its International Advisory Committee (2003-7). She was on the Board of NORFACE and was a member of the Governing Council of the European Science Foundation. Sam Friedman is Lecturer in Sociology at City University. He has a long-standing interest in the study of cultural taste and his forthcoming book, Comedy and Distinction (2014, Routledge), examines the relationship between social class and the consumption of comedy. Representing the first ever exploration of British comedy taste, the book explores what comedy people like (and dislike), how comedy taste lubricates everyday interaction, and whether some comedy tastes are valued higher than others in British society – representing a new resource of contemporary cultural capital. He is also leading a separate project examining how social mobility (both upward and downward) affects people’s cultural tastes and wider cultural identities. Outside academia, Sam is also the publisher of Fest (www.festmag.co.uk), an arts magazine that runs during the Edinburgh Festivals. Dr Friedman has also written freelance for a number of other publications, including The Guardian, The Sunday Herald and The Big Issue. Tim Newburn is Professor of Criminology and Social Policy and Head of the Social Policy Department, London School of Economics. Prior to joining LSE, he was Director of the Public Policy Research Unit at Goldsmiths College from 1997, having previously worked at the Policy Studies Institute, the National Institute for Social Work, the Home Office and Leicester University. He is the author or editor of over 30 books, including: The Future of Policing (with Morgan, Oxford University Press, 1997); Private Security and Public Policing (with Jones, Clarendon Press, 1998); Policy Transfer and Criminal Justice (with Jones, Open University Press, 2007); and, Criminology (Willan, 2008). Tim was President of the British Society of Criminology (2005-08) and Director of the Mannheim Centre for Criminology (2003-08) and was elected to the Academy of Learned Societies in the Social Sciences in 2005.